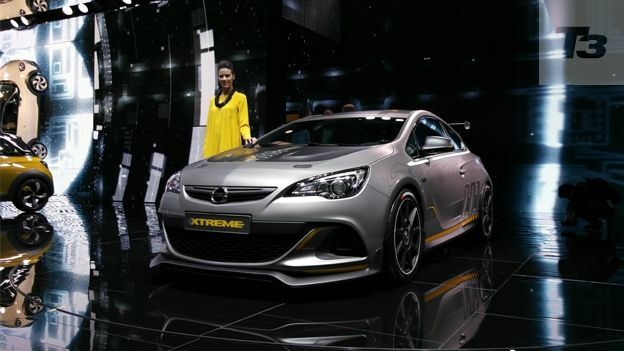 300hp street-racer is Vauxhall's fastest Astra ever..
Vauxhall has unveiled the Astra VXR Extreme, a 300hp hot hatch that boasts racetrack performance combined with all the modern comforts you'd expect from a road car including Vauxhall's in-car media system. Based on the Astra Cup the Astra VXR Extreme is the most-powerful street-legal Astra ever made and follows the highly sensible thinking of taking the already hot VXR and making it even more hot hatch. There's a 2.0-litre turbocharged petrol engine that develops 300PS which is then coupled to four enormous race exhausts so be guaranteed that when you arrive at the industrial park, there'll be a few bleeding ears. To help it achieve its goal of being the fastest Vauxhall available the company has shed over 100kg of weight through the use of carbon fibre and high-performance aluminium. Despite shedding 100kg of weight you still get the in-car entertainment system featured in the Astra which boasts car to phone connectivity, voice control and a powerful sat nav system. At the moment it's just a concept car but Vauxhall has openly admitted that if there's enough positive interest then they'll definitely make it.